Tonight I started the process of riveting the pro-sealed fuel tank filler opening and the drain plug. It was not easy! I manged to get all the rivets in but I found that it is easier to use the rivet gun and bucking bar but when I did that it was harder to get the rivets flush with the skin. I ended up drilling out a couple of rivets and redoing them, and realistically I should probably have drilled out another one or two because the did not squeeze as neatly as I wanted them to. Fortunately this is not a structural rivet joint so even if the rivets are only 95% as strong as perfectly set rivets it is more than enough. 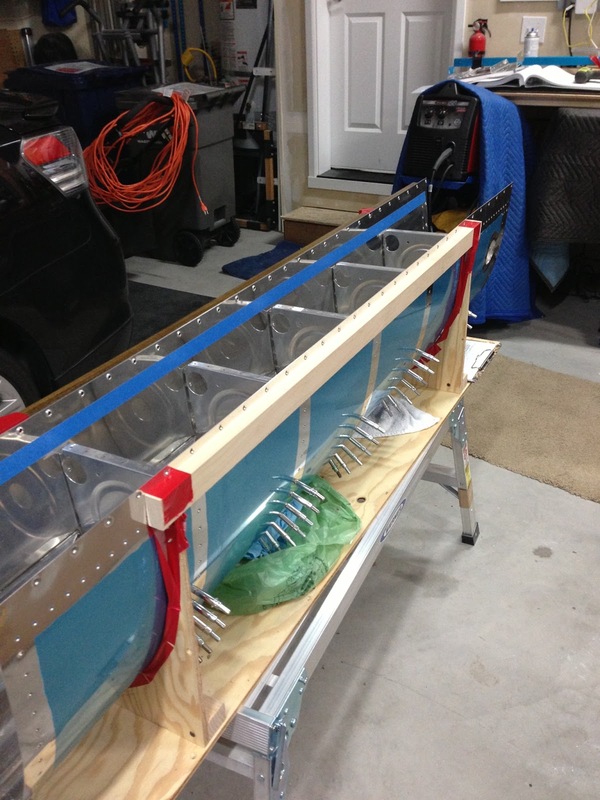 I also modified my fuel tank jig to allow me to put the skins in without a bow in the middle. Part of the next step is to cleco the ribs back into place and I don't want to use the force that my clamping jig requires. So using some examples from other builders I decided it cleco both side of the nose in place and then slowly insert the skin and ribs into the jig. The problem is that I was worried that this would "dent" the skin where the top edges of the jig would be pressing against the skin. See my solution below. 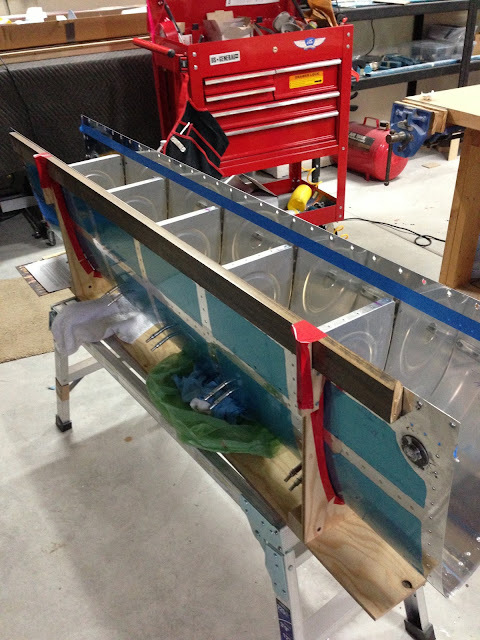 boards attached to fuel tank jig top to prevent bowing of the skins when they are in the jig. You can also see the riveted drain flange before I cleaned it up. 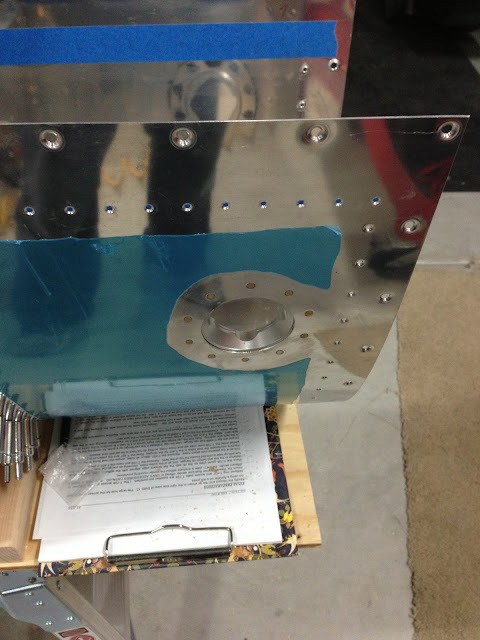 another picture of the board on the other side of the fuel tank jig. 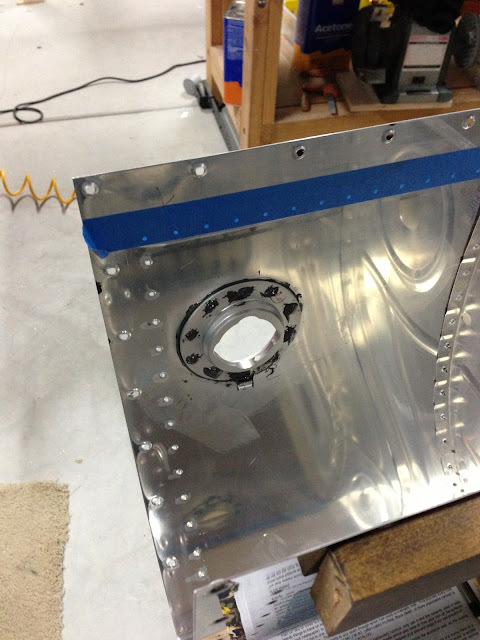 the inside of the riveted fuel inlet with proseal on the exposed shop heads.